No matter how much experience pilots may have, they always keep numerous checklists to go over on a daily basis. The same is true on eBay (although the only crashing that you need to worry about is on your computer). No matter how many times you buy or sell, the advice you find here can help you survive and thrive on eBay. Keep this in mind before you click the Bid or Buy button; you are legally and morally obligated to go through with the transaction if you win. Never bid or buy without checking the seller’s feedback. You need to be able to trust the person you’re buying from. Look for the Top Rated Plus Seller icon, but even if you see one, you may not find enough information. When you are considering buying a very pricey item, dig a little deeper. Investigate the seller’s feedback a bit more deeply by clicking the number next to his or her User ID. Even the rarest of items show up sporadically on eBay. Don’t just settle on a listing if you don’t feel good about a seller. Save the search and the item will most likely come up for sale again. Before you bid, make sure that you have some knowledge of how much you should pay for the item, even if you limit your search to completed listings to get an idea of how much the item went for in the past. Beware of getting caught up in the frenzy of last-minute bidding: It’s an easy thing to do. Many buyers neglect to leave a feedback comment for the seller of an item they’ve purchased. Whoa, people, that’s bad form. Realize that eBay is a person-to-person marketplace, and the businesses that sell on the platform are mostly home-based businesses. College students, single moms, family businesses, they’re all on eBay to earn some money. Your positive feedback means a lot to these sellers. Sellers are judged on your Detailed Star Ratings. A low star rating can even cost them money (eBay discounts Final Value Fees to sellers who have top service ratings in their DSRs). Leaving feedback, and thereby helping other members, is your responsibility as a community member. Remember that just because you’re conducting transactions from the privacy of your home doesn’t mean that you’re doing everything you can to protect your privacy. Legitimate buyers and sellers never need to know your password or Social Security number. Do not respond to any email that asks for that information. Do some homework. Know the value of your item. At the very least, get an idea of your item’s value by searching completed listings for similar items. 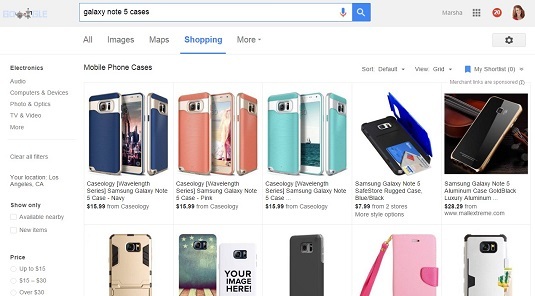 If it’s a new item, check out other online sites and see what your item is selling for by running a Google product search for your item. Make sure that your item isn’t prohibited, illegal, questionable, or infringing. It’s your responsibility! Search Google Shopping to learn more about items before selling or buying. Write an honest, thorough description. Take a good, clear photo. Work out your shipping costs and offer free shipping whenever possible. Make sure that your title is descriptive enough to catch the eye of someone browsing a category and detailed enough for a buyer to identify. Taking advantage of all 80 characters that eBay allows for your title gives you a fighting chance for your keywords to be found when prospective buyers search. The more search keywords you list, the easier it will be for someone to find your item. Play editor and scrutinize your text for grammar mistakes and misspellings. Typos in either your title or description can cost you money. Double-check the photo of your item before you post it. Is the lighting okay? Does the photo paint a flattering image of the item? Are the colors as accurate as possible? Use a white background with nothing to distract the buyer’s eye. Would you buy this item? Take your picture as if you didn’t have a description; be sure that it totally illustrates the item. Also, write your description as if you didn’t have a photo. Some buyers are visual and some just want to read the facts. Be factual and honest. On eBay, all you have is your reputation, so don’t jeopardize it by lying about your item or terms. Respond quickly and honestly to all questions sent via eBay Messages, and use the contact to establish a good relationship. Don’t let more than 24 hours pass without sending a response. If a bidder makes a reasonable request about payment or shipping, going along with that request is usually worth it to make a sale. Be up-front and fair when charging for sending merchandise to your buyer. Charging outrageous fees will penalize you in eBay search and is a violation of eBay’s policies. Live by the Golden Rule: Do unto others as you would have others do unto you. Ship the item within a day of the buyer’s payment — immediately is even better. And keep all your correspondence polite. Ship the goods as soon as you can. Be sure to input, as eBay requires, the tracking number into the transaction online, too. That way, buyers can eagerly anticipate the arrival of their goods. When shipping your items, use quality packing materials and sturdy boxes to prevent disaster. Don’t underestimate the power of positive feedback. Always generously dole out feedback when you complete a transaction. Your buyers will appreciate it and will hopefully return the favor. What should you do if you get slammed unfairly with negative feedback? Don’t freak out! If you feel it’s unjustly posted, do, however, contact the buyer and find out how you can make things right. If that doesn’t work, at least post a follow-up response for others to see. Keep in mind that, in most cases, negative feedback results from misunderstandings. Contact the buyer the moment you smell a problem arising and see if you can work things out to your satisfaction. If you don’t update your contact and credit card information, and that leaves eBay and other users unable to contact you, you can be suspended.